Raising kids is sure a challenging job...I have done something similar when I was younger..now I know how my mom must have felt at that time..
Lucky there's man around, the saviour. Oh my! A tangled mess indeed. Glad that you were able to get her un-tangled. Reminds me of the time I put bubble gum on my brother's hair... My mom just had to snip off that chunk! Oh. Glad the Tangled Mess ended with no cutting of hair. Geee...i do not know whether to feel sorry or laugh about it. Ouch!! Reminds me of the time when my sisters and I stuck chewing gum on one another's hair!! Yay, I see your posts on Google Reader now. Good action that saved some hair!! When I was small, I fell from a table and had a gash on the back of my head. That was when my mum had to snip hair away to apply some black medicaton. Oh wow! I'm glad you were able to undo that mess! @GinaF: Thank you for the advice. I thought about using olive oil to get the hair slippery but didn't use it because the hair was folded over each other that even when I pulled, it wouldn't loosen. 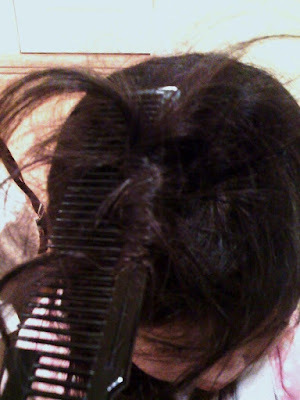 It was so tightly wrapped into the comb. Will remember your advice. Hope there wouldn't be another episode! The things kids get themselves into. At least you'll know they won't do that again. Oh my goodness, I had those moments before when my children were smaller. Glad you un-tangle that mess.. I'm sure they'll still think it's good/funny to play hair salon AGAIN! hahaha... Anyway, luckily the incident ended without hair cutting or else the little girl may be sobbing. Hi Rosebelle, ha ha, kids can make us laugh, same time make us panic....or the 'what the...'? I too would get abit nervous when there's no sound coming from the kids room....ha ha. Have fun and best regards, Lee. Yeah, silence means trouble! Good thinking for Daddy to untangle the mess. That's some marvelous feat of engineering you got there. I can't even imagine how the comb got stuck in her hair like that. Our kids are evolving way too fast. Oh dear! My daughter had "tried" to style her hair one time and it almost looked like this. And sometimes she would style mine and I would have to work and work to get it untangled! I rolled a plastic brush all the way up to my scalp as a little girl. My mom pulled it out with major effort. She never batted an eye. I can't imagine being so calm! Glad you got it out without making your daughter bald! Girls love to play hair salon game so much. I loved doing it too when I was a kid. My daughter also love to style my hair but I would always ask her to stop before my hair got tangled!I know the risks! I would be panicked if I were in the situation. Breaking the comb into two is a brilliant idea! I would never think about it if i were in the situation..